The Guangxi Clique is a Chinese warlord clique located in the southern part of China. It borders China to the north of it, Yunnan to the west and French Indochina to the south. The nation has access to large amounts of steel and tungsten and is an important strategic region for any Asian power due to this. Along with a core population of just over 50 Million, the Guangxi clique has the potential of being a notable minor power in the Asian region if one does not choose to reunite with China. Along with Shanxi, Yunnan, Xibei San Ma and Sinkiang, it is one of the chinese warlords. China, Guangxi served as the base for one of the most powerful warlord cliques of China: the Old Guangxi clique. Led by Lu Rongting (陆荣廷, 陸榮廷) and others, the clique was able to take control of neighbouring Hunan and Guangdong provinces as well. The Old Guangxi clique crumbled in the early 1920s, and was replaced by the New Guangxi clique, led by Li Zongren, Huang Shaohong, and Bai Chongxi. Communist China and power struggles within the Kuomitang resulted in Li Zongren renoucing the post and returning to Guandong in 1950. 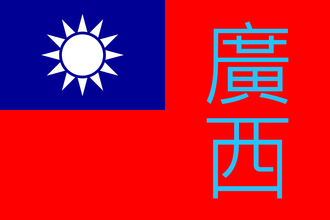 When the province fell to the Communists, Li Zongren went into exile in Taiwan along with the rest of the Kuomitang. The Guangxi Clique has access to a large amounts of Steel and Tungsten and holds the majority of resources in China. The Guangxi Clique has a small Industrial base that is likely to be bolstered by other nations importing resources from it. Guanxi's Infantry Divisions have the standard Chinese Juntan template of 4 Infantry companies. The Guangxi Clique starts off with the most resources in China, and a few nations usually trade for those resources at the beginning of the game. The player can use the extra civilian factories to more effectively construct more factories or forts than the other warlords. Going down the industrial tree is very beneficial early in the game as it gives a research slot, as well as a civilian and a military factory, at that stage of the game boosting Guangxi's industry significantly. As with smaller nations and China, generally produce only infantry equipment at the beginning, and then start a line of artillery for support artillery after making sure there is enough infantry equipment for the war. If seeking to ally with the Nationalists, it is a good idea to first make sure the United Front forms, by forcing the Xi'an Incident (which cannot happen once Japan and China are at war). Once Japan invades, the player should help the AI defend the southern ports from Shanghai, and only sparingly send troops to the front lines. The troops of the front line should only be there to ensure the Japanese do not encircle half of the Nationalist army. After joining the republican government, the player should negotiate for support from the other warlords (aside from Sinkiang) as soon as enough political power and/or army experience is accumulated. This ensures that the other warlords will not be able to join the republican government and threaten the player's ambitions to annex China. Depending on the strategy, it is actually good for the player to let the Japanese take the northern provinces. First, since after forming China, the player inherits all the Nationalist negative traits, it is a good idea to let the AI get rid of the Army Corruption/Army Reform decisions before building support in provinces. Second, the Nationalists lose support from every state they do not own, so after the Nationalists lose the northern provinces they should have around <30 support points. Guangxi on the other hand, with the support of Yunnan, Xibei San Ma, and Shanxi, should have 20 support points. Now the player should focus on building support in two provinces that have the least support for the Nationalists, and once those two support Li Zongren for the Premiership, it should be enough to take the Take National Leadership decision. Taking that decision will force the Nationalists to integrate their territory into Guangxi, and the player will have control of the Nationalists' army, air force, and navy (if navy exists of course). After that it will be a classic China game. If seeking its own destiny, the Guangxi Clique can very effectively use Border Conflicts to seize territory from western warlords starting with Yunnan and Nationalist states while the Nationalists are busy. One strategy is to focus on the west to keep the Nationalists between Guangxi and the Japanese, but the Japanese also come down the coast so using Border Conflicts to occupy the southeast coast helps protect the core Guangxi territories. When making border conflicts, it is best to use divisions of 7 Infantry and 2 Artillery, as this will max out your combat width while providing overwhelming firepower. If you plan to drive Northeast, perform border conflicts with the Nationalists first. If you plan to go west, conquer Yunnan first.